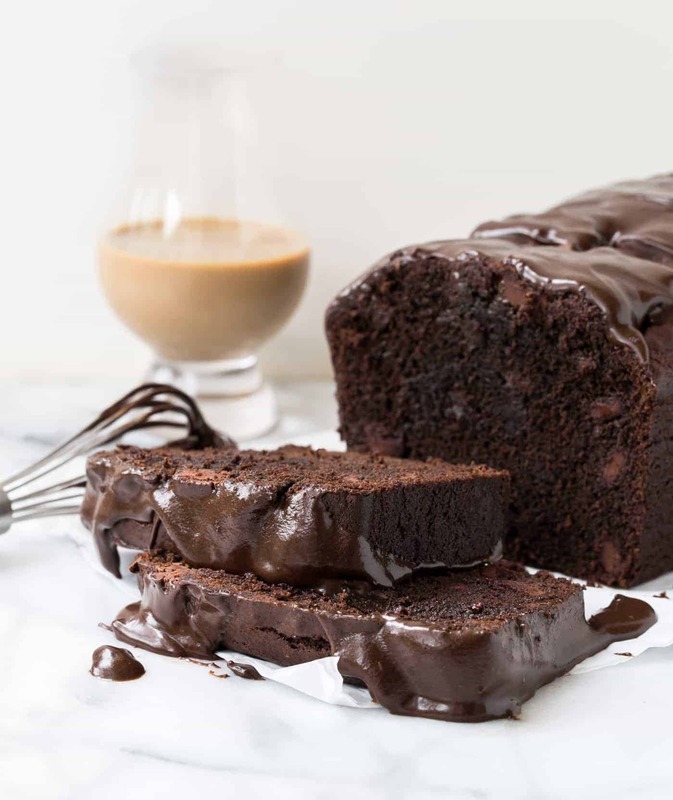 Take your after dinner drink in edible form with this decadent Triple Chocolate Irish Cream Loaf Cake! Why choose between dessert and an after dinner drink when you can have both? 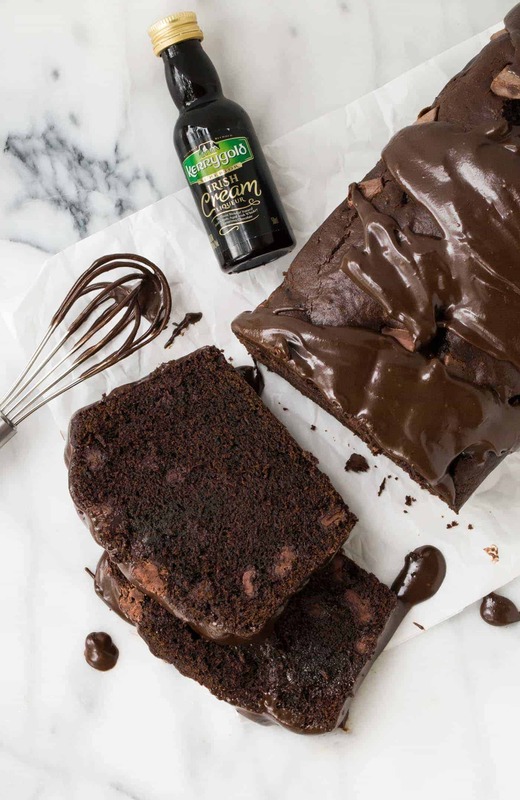 This luscious Triple Chocolate Irish Cream Loaf Cake contains a generous pour of Kerrygold Irish Cream Liqueur, a blend of natural Irish cream, real chocolate and oak-aged Irish whiskey. The result? A memorable post-dinner indulgence. What is a loaf cake? A loaf cake is basically any cake that is baked in a loaf pan. Often they are more dense than a regular round cake or sheet pan cake. Think pound cake texture. You definitely need to be a chocolate fan to enjoy this Triple Chocolate Irish Cream Loaf Cake, but if you are a fellow chocoholic, you’re in for a real treat. This loaf cake starts off with dark cocoa to give it a rich color and strong flavor. A few stir-ins, including dark chocolate chunks and Kerrygold Irish Cream Liqueur, add to the chocolate bounty. The final splash of decadence is a generous pour of chocolate ganache-like frosting on top of the loaf cake. Tip: I used a double dutch dark cocoa from King Arthur Flour, a blend of dutch-process and black cocoas. It’s a pricier option than grocery store cocoa powder, but I love the depth of flavor it gives this recipe. Feel free to swap in whatever cocoa is available to you. This Triple Chocolate Irish Cream Loaf Cake freezes well (sans frosting), so whip up a few batches and pop them in the freezer for the holidays. Or freeze individual slices and pull one out to reward yourself after a long day. Might I suggest a glass of Kerrygold Irish Cream Liqueur to round out your indulgence? Why choose between dessert and an after dinner drink when you can have both in this decadent Triple Chocolate Irish Cream Loaf Cake? Preheat oven to 350 degrees. Grease an 8.5- x 4.5-inch loaf pan. Place sugars and butter in a large bowl and beat until light and fluffy. Mix in eggs, one at a time, followed by milk, liqueur and vanilla. Gently stir in flour mixture and chocolate chunks until just combined. Pour cake mixture into prepared loaf pan and bake for 45-55 minutes or until toothpick inserted in loaf comes out mostly clean. Cool for 15 minutes in pan before removing to finish cooling on rack. You may freeze the loaf at this point. Wrap tightly and store in freezer for up to 6 weeks. Whisk together cocoa powder and powdered sugar in a small bowl. Stir together melted butter and liqueur and pour into cocoa mixture. Stir until smooth. Put a cooling rack on a sheet pan and place cooled cake on rack. Pour frosting over cake. You may have extra frosting leftover depending on how much you add to your loaf cake. There are not any instructions included. Am I missing something? Hi Kathy, Yikes! We’ve done some behind-the-scenes work on our website lately, and it looks like our directions might have been stripped from the recipe during that process. Thanks for bringing it to our attention. All fixed now! Looking forward to making two of these for a special dinner!